A really fun sheet of cards was also included in my Fix. It has a note from my stylist in the upper left corner. The short version is that she did two awesome things – she read my request for vacation clothes (Yellowstone! ), and she picked out an item to go with an item I kept from a previous box. Look how cute this top is! It’s sheer chiffon with a built-in white knit tank underneath. I like the pattern and the sleeve length a lot, and I think the neckline is flattering too. Rachel participates in our paid Influencer Program. Even though it will stay warm here in the San Diego area for quite some time, I still want to feel like it is Fall and change up my wardrobe as such. For this month’s Fix, I specifically asked my stylist to send me items in Fall trend colors, but to make sure they are light enough to be worn here in our warmer temps. She did exactly that! This top is the epitome of what I wanted when I asked my stilyst for fall trend colors in lightweight pieces. I love the mustard and burgundy and the fun print. The sleeves are slightly longer than my summer tops and while the bottom hem is longer in the back, it does not look weird this time. Even though it is still hot out, I definitely feel like Fall is in the air with this top. I paired the outfit with the brown booties that also came in this month’s Fix. Right off the bat I really liked that they had a ruggedness to them. The darker coloring at the toe and low, stacked heel made me think of riding boots, yet the bootie cut is cute and in line with current trends. See the full post from Amber Burst. This month’s box was the best Stitch Fix box I have ever gotten. Seriously, I’m having such a hard time deciding what to keep. I’m so happy that I took the time to work on my Style Pinterest board and leave some detailed notes for my stylist. It really seemed to pay off. As soon as I saw these pieces in the box, I swooned. This cardigan is on my Pinterest board and I was so excited to get it in my box. (You can see how windy it was because the cardigan was flying all over the place!) This top is absolutely perfect for summer. I love the teal color and the floral pattern. So gorgeous! See the full post from The Observant Turtle. I love Stitch Fix! They keep my closet interesting and I still get excited every time I see one of those cute Stitch Fix boxes show up on my doorstep! This month’s box did not disappoint! Every item pleasantly surprised me, and I can honestly say, I like it all! LOVED this. I’m always on the lookout for bright & fun patterns, that aren’t played out like the chevron print. This was the first piece of clothing that stuck out to me in this box, and I was even more in love once I tried it on! I’m excited to get some use out of this once the sun decided to show it’s face. See the full post from A Sorta Fairytale. 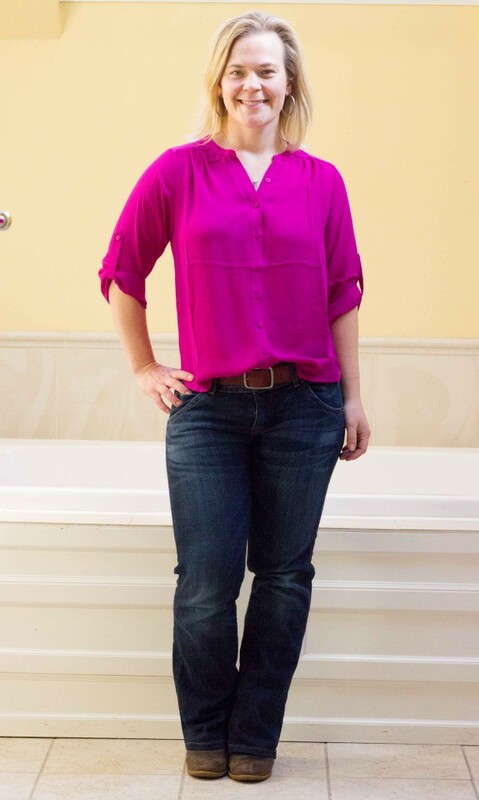 This hot pink Melandry Button-Up Tab-Sleeve Blouse from Collective Concepts. My stylist, Britney, selected it for me since I had a really similar blouse on my Pinterest board. I really like this blouse. It’s light and airy, perfect for layering now and wearing with a camisole into spring. A shot of pink was exactly what I needed to wake up my brown, gray, navy, black winter wardrobe.